How many times have you experienced opening websites that took longer time than usual to open? I am not talking here about sites with too much animations, it’s just a static site with many images in it. By taking longer than usual, I mean that compared to another site with same number of images, these sites normally take say 30 to 50% longer or even more in some cases. The reason for having such sites and the recommended solution on how to have them open faster is the topic of this blog. Current Internet users whether productive (researchers, bloggers and emailers) or leisure (social networkers, chatters and gamers) kind upload images for others to browse and/or download. Images that we upload on the web are usually photos taken by digital cameras and saved in what is called as JPEG or JPG file format. There are many image file formats (JPG, PNG, BMP, TIFF, etc.) but JPEG is commonly used because it is the standard that requires the least space for images to be stored. The smaller the image in terms of storage space (expressed in kilobytes or megabytes) the faster it can be uploaded, opened and downloaded. As users of the Internet we prefer sites that open fast so the size (in terms of storage space) of the image that we upload to our social networking sites, emails and blogs should be as small as possible. While the JPEG format is already acceptable, there is still a way to make it smaller for uploading to the Internet. This is called “save for web” option which can be found in some image editing software. Save for Web allows users of image editing software to find compromise between minimal file size and acceptable quality of image quickly. Saving images for the web before uploading would minimize if not totally prevent having slow-opening websites. Adobe Photoshop, a proprietary image editing software, has Save for Web feature by default but being proprietary, you will have to pay for its license to use it legally. 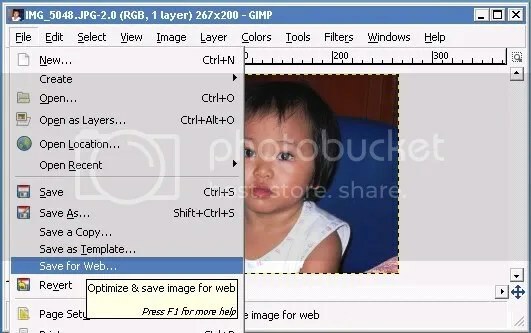 A good alternative is the open-source GIMP (GNU Image Manipulation Program) but you will have to install the Save for Web plugin if you want to use the feature on images that you will upload. Installing the plugin on GIMP will be the topic of my blog tomorrow. I am a technician for my business as well as the manager so website maintenance is in my control as well. We have had many upset customers who have struggled to use our website due to the slow loading pages caused by the images we have used, but after downloading GIMP and the save for web plugin 2 months ago, we have received no complaints and have had a lot are positive feedback. I downloaded it after reading this blog so i say thank you for the advice!